Finally, more signs of spring, sunshine and getting a little warmer. I had to wait until a couple of hours before high water to make sure no ships wanted to move, then it was some butties and a flask and off to the Old Man of Coniston again with a couple of friends. I wanted to do another mountain further north, but when I went for a newspaper earlier I nipped up Hoad Hill, just outside the town. It's a popular vantage point and from there you can see most of the mountains to the North, and the onle decent size one without clouds was the Old Man. No point going up anywhere if you just climb into cold wet miserable fog. I wanted to use it as cardio and leg strengthening, so we split up at the bottom and I started up. My record from the car park to the top was 58 minutes last year and I set off at a decent pace. Worry set in when I had to stop a couple of times to get my breath back, but with a fair while to go until June 25th there is plenty of time to get cardio fit. Still, when I broached the top and touched the Cairn at 54 minutes, I wondered if my watch was wrong. I was rewarded with spectacular views today. Gale force winds, (we climbed the East side which was shelter from the westerly winds) made it difficult to stand on the top, but the clouds forming on the ridge to the west (on the left of the picture above) saw them swirling around us , over the top and down towards Coniston village. Windemere was easily visible in the east and Barrow in distance to the south. The Isle of man was invisible, I've only seen it once in the month I've been back here, thanks to the miserable spring we've had so far. My mate and his wife turned up twenty minutes later and decided the view was that spectacular they didn't want to go down again! Lunch, then we did start down. Normally I set off towards the west to take in a couple of other peaks; we had come up the tourist route, but as the wind was still strong on the west side we had to go back down the way we came. The graph above shows fluctuations in speed, to be accepted as you climb, and I don't know if it shows lateral speed or takes ascent into account. 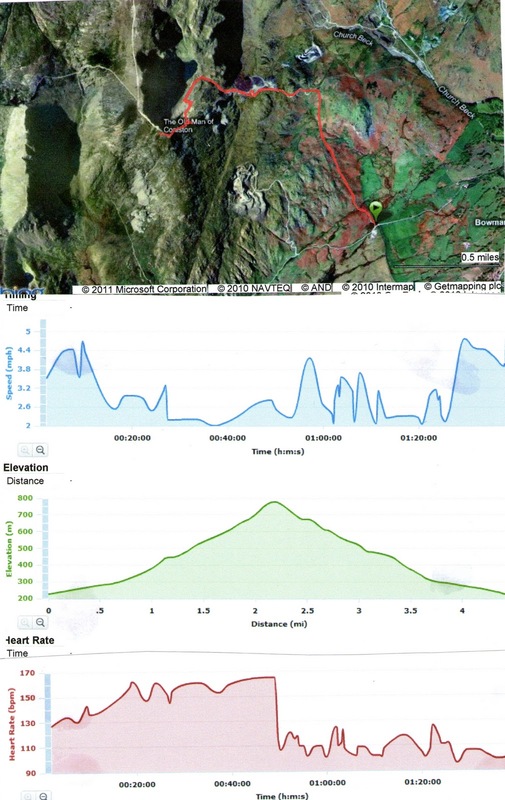 Still, according to a fell running friend at work, climbing mountains like this has many advantages, firstly the Cardio, the heart rate graph shows high average on the way up and low on the way down. (the sudden change shows the point in which we came back down) The climbing strengthens hamstrings, calves, quads, back and stomach muscles. The uneven ground at speed helps strengthen ankles and all the auxiliary tendons and muscles around the feet and lower legs, my feet ache even now as well as slight ache all over the legs. The gasping for breath in the fresh air helps oxygen circulation, and the rewards of climbing mountains puts a smile on your face which money can't buy! I'm resting now, got a session with my coach which includes a timed 10k near cleethorpes on Saturday so I want to be fresh for that, but suddenly its not twelve weeks which I was typing only moments ago, (or so it seems, 2 or 3 days) but 11 weeks. A week gone in the blink of an eye. So, when I got back, I ate, drank plenty, watched "Hot Fuzz" (very funny) then got out for my 8.5 mile circuit over the Hlls north of Ulverston. Overdoing it? I'm currently in a state of panic, self doubt and worry that I'm getting it all wrong and I'm just doing damage to the muscles. I'm like this before every race, but normally no-one knows this as I'm just another anonymous walker. This time I've decided to write it all down for my family, a couple of friends and a few strangers to read on the Parish website so I've put myself in the public eye. I'm convinced it's all going to go wrong and I'm going to have to trot out excuses. I have improved every Parish, and the thing that upsets me most is that there will come a point where I will reach my limit and never do any better. Last year everything came together and if it wasn't for problems on the day I'm convinced I would have had a sub 16 hour race. I'm just wondering now if last year was my peak. Still, what I have learned from experience is that races are completely different from training. The atmosphere, attention, adrenaline and detrmination to succeed all come together to bring out that little extra which you can't normally find when training.